Perfectly crispy roasted cauliflower that’s surprisingly addictive and the perfect side for just about any meal! Cauliflower was the first vegetable I ever roasted, and it was just a couple of years ago. I roast vegetables every single week now, but until college, I’d only ever had raw, steamed, sautéed, or grilled veggies. All of those are great in different ways, but I think roasted veggies are infinitely more delicious. Although, I should clarify that I’m definitely not a fan of raw cauliflower. We once “dissected” a cauliflower in my middle school science class like it was a brain. It was covered in different types of candy like fruit roll-ups and Nerds rope to represent different parts of the brain, and the smell of raw cauliflower mixed with sugary candy has haunted me since. I was clearly not meant to go into medicine if I couldn’t handle a cauliflower brain ha. But roasted cauliflower– I’m all on board with that. 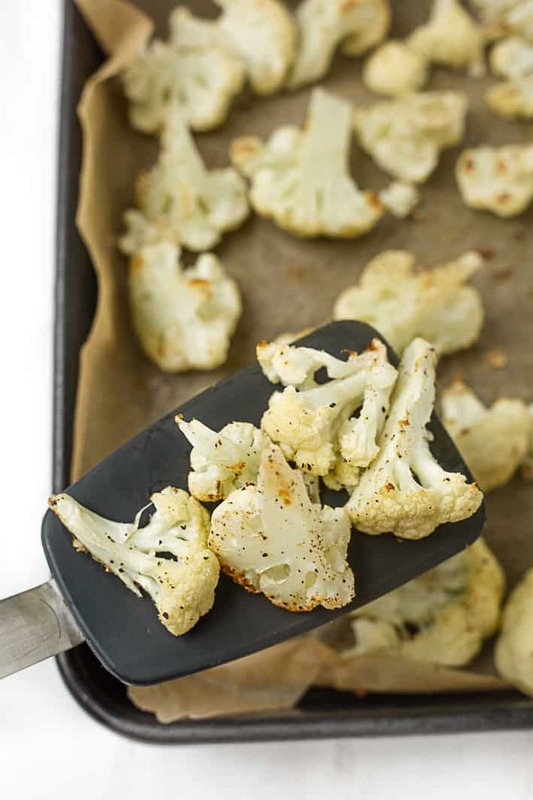 I first posted this roasted cauliflower recipe back in 2014, when I’d just discovered the world of roasting vegetables, and I remember how my dad could not stop eating roasted cauliflower once I introduced it to my family. It wasn’t long before I started roasting sweet potato wedges, one-pan chicken sausage dinners, potatoes for potato salad, and more. 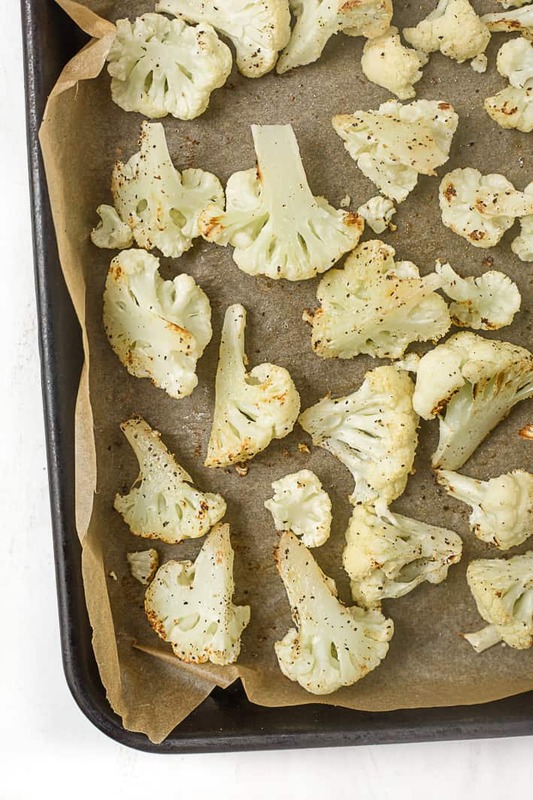 The instructions for roasting veggies are pretty much universal: just wash and dice veggies, dry them, put them on a parchment-lined baking sheet, drizzle with oil, and sprinkle with salt, pepper, and garlic powder. You can also get creative and add any spices or seasoning blends you like. 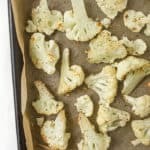 I wanted to update this post with some tips I’ve discovered throughout the year for perfect roasted cauliflower. • Line your baking sheet with parchment paper for easy clean-up. I love this natural unbleached parchment paper. • Don’t crowd the baking sheet, because it’ll cause the veggies to steam, rather than roast. • Use fresh veggies, not frozen. Frozen cauliflower is good in smoothies (I’ve heard), but it won’t crisp up in the oven. • Flip the broiler on at the end for 60 seconds, watching closely, to crisp up the veggies if needed. I don’t ever do this for cauliflower, though, since it crisps up well on its own– mostly potatoes! • Don’t over-bake the veggies, especially cauliflower, since it’ll turn to mush. I hope you love this crispy roasted cauliflower as much as I do! If you make it, feel free to let me know in a comment or take a photo and tag me @livbane on Instagram! Perfectly crispy roasted cauliflower that's surprisingly addictive and the perfect side for just about any meal! Cut green leaves off of the bottom of the cauliflower. Slice it in half from top to bottom. Using your hands, pull the cauliflower apart into its natural florets. Slice the largest florets in half. Place florets in colander and rinse well. Using a clean dish towel or paper towels, dry cauliflower thoroughly. Line a baking sheet with parchment paper and place cauliflower on paper. Drizzle cauliflower with oil, and sprinkle with salt, pepper, and garlic powder. Bake at 425 degrees for 14-16 minutes, until tender and crispy. (No need to broil cauliflower at the end.) Do not over-bake. Serve right away! This looks so good! 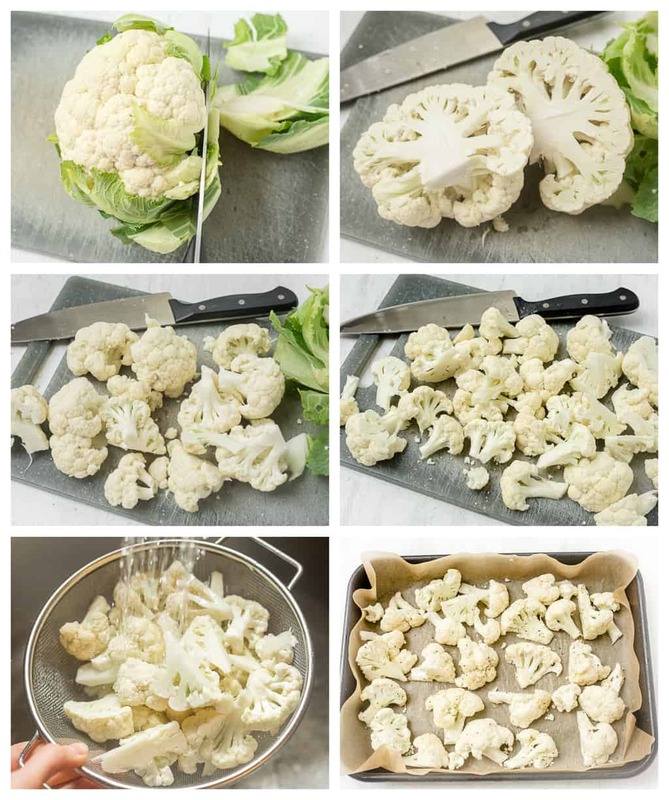 I always cook my cauliflower the same way…will definitely try this next time! Omg!! I HATE vegetables and will gag just smelling them but after trying this glorious dish/snack I LOVED it!!! To me it literally tastes like a French fry with a different texture! Thanks to you I have now found a veggie that I actually like! I’m going to experiment some more with cauliflower and see what different dishes I can make with it. I can’t thank you enough for helping me to eat healthy! Yay!! I’m so happy to hear how much you love roasted cauliflower now, Breanna! It’s still one of my absolute favorite veggies to roast (although sweet potatoes are up there, too! Definitely going to try sweet potatoes now too. 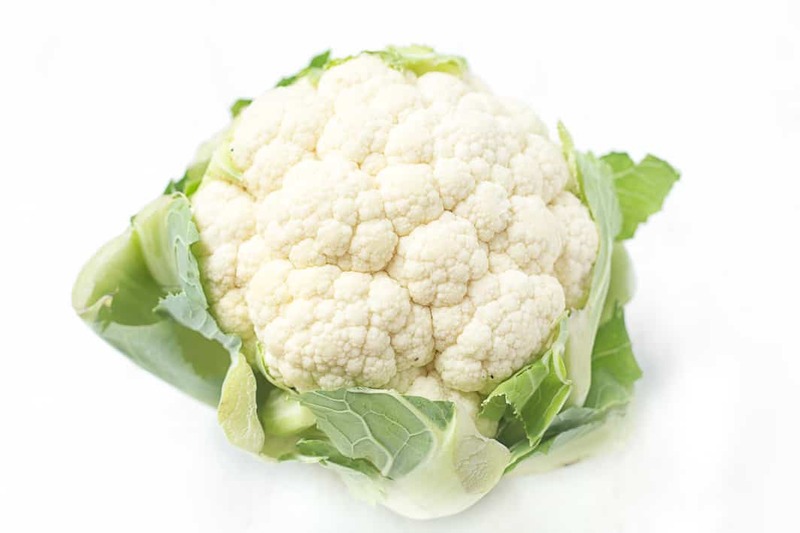 Any other vegetables that taste similar to cauliflower or that have a very mild taste? If so tell me your recipes! I have been trying to eat healthy for months and now I can!! I also put the cauliflower on salad and it was wonderful! I can’t thank you enough! Oh no. Tried this a couple if times and my cauliflower always gets saggy, definitely not crunchy. Where am i going wrong? They were very dry, maybe i put too much olive oil? 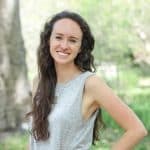 Hi Julia! I apologize for somehow missing your comment before. If you dried your cauliflower thoroughly and it still gets soggy, it sounds like you may be over-cooking it. Try cooking for a couple minutes less and try a piece then! This is definitely one of my favorite snacks! I use ghee instead of the avocado oil on cauliflower. So yummy! Ghee is really good, too. I’ll add a note in the recipe mentioning ghee is an option! Roasting veggies literally changes the taste of veggies so much. It has made me love broccoli more, even peppers and onions more, and I can’t describe how delicious roasted potatoes and sweet potatoes are. I haven’t tried cauliflower yet though, but it looks AMAZING!